Wrapping up the championship series, and all its implications. The condo development Saratoga West sits right across the street from Del Mar Racetrack, which could have been called Saratoga Race Course West during the 34th Breeders’ Cup, Nov. 3-4. 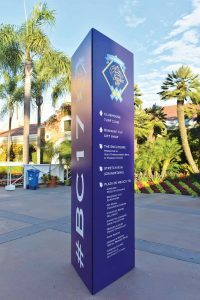 Held at the Santa Anita racetrack in 2016 for a record ninth time, the Breeders’ Cup made its debut this year at Del Mar, “Where the Turf Meets the Surf,” north of San Diego. While the Capital Region residents who support Saratoga racing every summer understand that it is a high-class meet, the results of the Breeders’ Cup show every year that it is the most important meet in the country. The 2017 stats clearly tell the story: A total of 52 of the 159 horses that competed in the Breeders’ Cup had at least one start at Saratoga last summer. That’s 33 percent. Six of the 13 races — 46 percent — were won by horses that raced at the Spa in 2017. That group of stars was headed by Breeders’ Cup Classic winner Gun Runner, who tuned up for Del Mar with resounding victories in the Whitney and the Woodward at Saratoga. A seventh Breeders’ Cup winner, Rushing Fall, in the Juvenile Fillies Turf, trained at Saratoga, but was scratched from her scheduled debut when rain arrived on the closing weekend of the season. Rushing Fall and Juvenile winner Good Magic are both trained by Mechanicville native Chad Brown, who now has 10 Breeders’ Cup winners in 10 seasons. Brown ranks fourth in the BC standings behind D. Wayne Lukas (20), Bob Baffert (14) and Aidan O’Brien (12). Add Rushing Fall to the list of Saratoga horses that won at Del Mar, and the percentage jumps to 54 percent. Eleven of the 13 Breeders’ Cup races had at least one Saratoga runner finish in the top three. Fourteen of the 39 in-the-money places had a Saratoga horse: 36 percent. Gun Runner, owned by Winchell Thoroughbreds and Three Chimneys Farm, was the standout of the Saratoga season, and he is a lock to be named the Horse of the Year and champion older male horse at the Eclipse Awards ceremony in January. Forever Unbridled won the Personal Ensign on Travers Day, and her victory in the Distaff clinched the Eclipse Award for older female. She is expected to remain in training in 2018 and could make another appearance at the Spa for owner Charles Fipke and trainer Dallas Stewart. Abel Tasman won her fourth Grade 1 race of the season, the Coaching Club American Oaks, on the first weekend of the Saratoga season. Her runner-up finish to Forever Unbridled in the Distaff, Abel Tasman’s first try against older horses, assured her of the 3-year-old female title. Good Magic became the first maiden — a horse without a victory — to win a Breeders’ Cup race. Bolt d’Oro, who finished third in the Juvenile, is the likely 2-year-old male champion, but Good Magic established himself as one of the early favorites for the Kentucky Derby. Fourstardave winner World Approval captured the Mile for breeder-owner Charlotte Weber’s Live Oak Plantation and trainer Mark Casse, putting himself in contention for the older turf male championship. Weber is a longtime trustee of the National Museum of Racing. World Approval’s top rival for the Eclipse Award is the Brown-trained Beach Patrol, a two-time Grade 1 winner, who was second in the Turf. Also completing the Saratoga-Breeders’ Cup double were the New York-bred Bar of Gold in the Filly and Mare Sprint, and Caledonia Road in in the Juvenile Fillies. Bar of Gold is the third New York-bred to win a Breeders’ Cup race. She was bred by and is owned by Chester and Mary Broman, who operate the Chestertown Farm in Warren County. Trained by John Kimmel, Bar of Gold rallied from far back to win the Filly and Mare Sprint by a nose, at 66-1. She paid $135.40, the second-highest in Breeders’ Cup history. Caledonia Road won her first career race in the mud at Saratoga on Sept. 3. 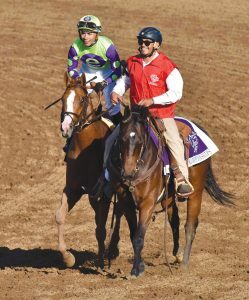 Brown’s two wins at Del Mar strengthened his bid for a second-straight Eclipse Award as the leading trainer in North America. Todd Pletcher edged him for the 2017 Saratoga training title and won two of the three Triple Crown races, Always Dreaming in the Kentucky Derby and Tapwrit in the Belmont Stakes. Brown won the Preakness with Cloud Computing, a slew of other graded stakes across the country, and continued his remarkable run of success in the Breeders’ Cup. The $6 million Classic was billed as a showdown between defending champ Arrogate, winner of the 2016 Travers in track-record time, and Gun Runner. 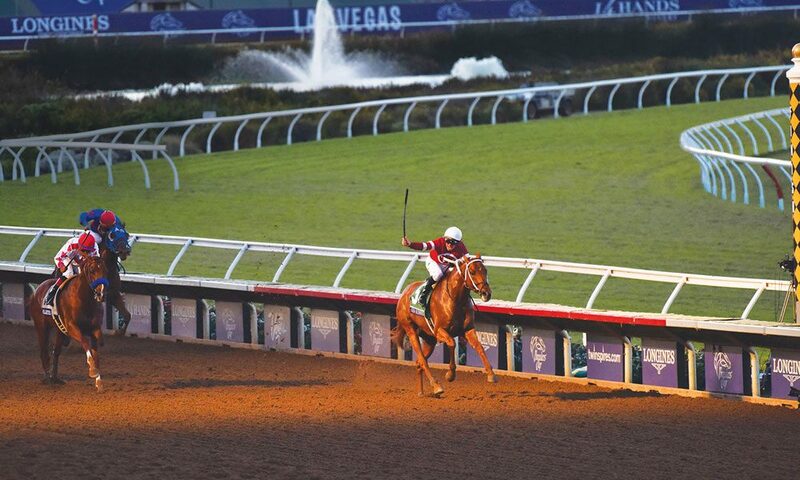 While Arrogate tailed off after defeating Gun Runner in the Dubai World Cup in late March — losing two straight at Del Mar — Gun Runner flourished. He won the Whitney on Aug. 5 by 5 1/4 lengths, and the Woodward on Sept. 2 by 10 1/4 lengths, under jockey Florent Geroux. 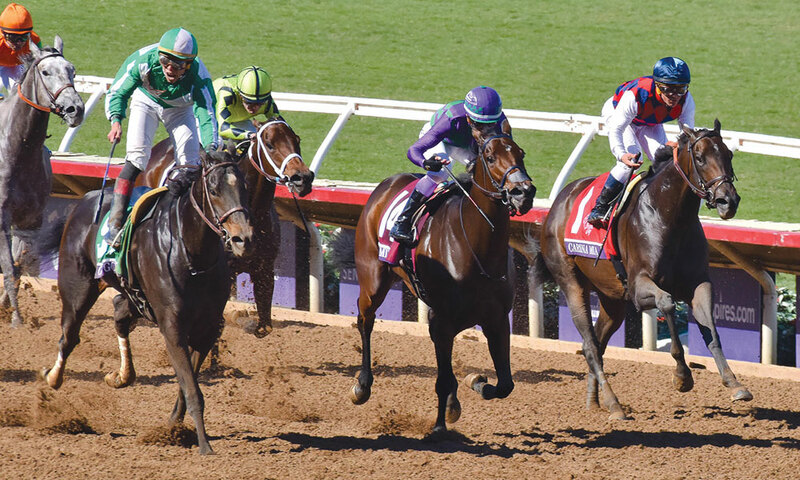 Although Del Mar had not been favorable to front-runners on dirt on Breeders’ Cup week, Hall of Fame trainer Steve Asmussen decided not to change his runner style. Gun Runner went to the lead, handled the pace pressure of Collected, and scored a very professional-length victory. Arrogate never was a factor and finished fifth.